In May, National PTA’s Every Child in Focus campaign centers on Military Appreciation Month. 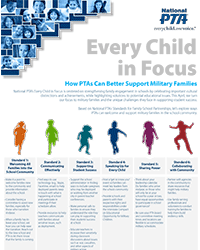 Using the PTA National Standard for Family-School Partnerships, we will explore ways PTAs can welcome and support military families in the school community. Join the conversation. Follow us on Twitter and use the hashtag #EveryChild. 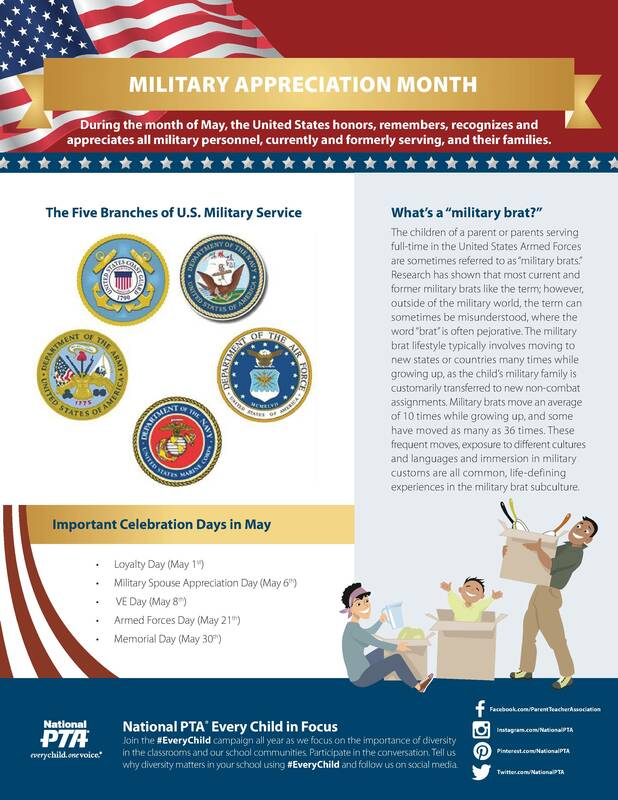 View our infographic for a visual snapshot of Military Appreciation Month. The children of a parent or parents serving full-time in the United States Armed Forces are sometimes referred to as "military brats." Research has shown that most current and former military brats like the term; however, outside of the military world, the term can sometimes be misunderstood, where the word "brat" is often pejorative. The military brat lifestyle typically involves moving to new states or countries many times while growing up, as the child’s military family is customarily transferred to new non-combat assignments. Military brats move an average of 10 times while growing up, and some have moved as many as 36 times. These frequent moves, exposure to different cultures and languages and immersion in military customs are all common, life-defining experiences in the military brat subculture. Through its Every Child in Focus initiative, National PTA is hosting a series of virtual events for PTA leaders, educators, and family and community engagement professionals to educate about effective family engagement and community outreach strategies. Each event will feature guest speakers with real-world insights to help parent leaders, educators, and community organizations understand perspectives of families, overcome barriers to family engagement, and deepen relationships in ways that will yield new parent leaders and advocates for children.